Sunday Morning an Annular / Hybrid Solar Eclipse will be visible at sunrise along the east coast of the United States. What is an annular eclipse? An Annular Solar Eclipse is when the Moon passes directly in front of the Sun, but the Lunar Disc isn’t large enough to cover the entire surface of the Sun. As shown below. We will not see the entire eclipse as it favors the Atlantic Ocean and western Africa. There will be some neat photo ops with a “bite” taken out of the Sun. A few sunspots will also be peppering the Sun’s Surface. This eclipse is of the rare hybrid variety— that is, it will be an annular eclipse along the very first 15 seconds of its track before transitioning to a total as the Moon’s shadow sweeps just close enough to the Earth to cover the disk of the Sun along the remainder of its track. For the people along the East coast of the United States we should be able to view it at sunrise low in the eastern sky. How rare are hybrid solar eclipse? Of the 11,898 solar eclipses listed over a 5,000 year span from 1999 BC to 3000 AD in Fred Espenak’s Five Millennium Catalog of Solar Eclipses, only 569, or 4.8% are hybrids. – Universe Today. 6. Can’t do any of this without clear skies! In May 2012, I photographed the Annular Eclipse “Ring of Fire” Over The Iconic Horseshoe Bend in Northern Arizona. Hundreds of people showed up with everything from small point and shoot cameras to some super large telescopes. One person almost fell off the 1,000ft cliff while trying to get find a “good spot” to snap a picture from using a point and shoot. Be careful no matter where you are! My tripods are in the bottom right closest to the edge you two other awesome guys who came out for the workshop tour! WHAT WILL IT LOOK LIKE FOR US SUNDAY MORNING??? We are on the back side of the Eclipse so we will not see the entire eclipse.. For us in the United States, We will have to wait for 2017 when a Total Eclipse will race all the way across the Country, but Sunday morning will be a very rare event indeed. If you live in Africa, you will get the best viewing, unless you are in a boat in the Atlantic Ocean. Hope this helps and remember to set your clocks back Saturday night and be super careful when looking at the Sun! The Perseids are here! As seen on National Geograhpic’s website. Every year we enter a swath of debris from Comet Swift-Tuttle sparking these “falling stars”. Last year was a bust with a full moon washing out all but the brightest ones. As pictured below.. I have had the honor of photographing this meteor shower multiple times from many places. Last year I photographed it from Utah, Arizona and Pennsylvania and I’m planning on extending that streak to a couple additional states this weekend. 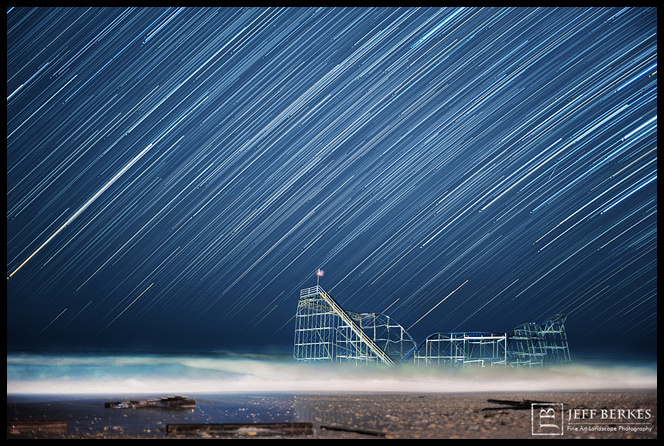 Here are a few shots from past meteor showers. Quadrantids in the Florida Keys 2012! You can see these meteors in any direction in the sky. Make sure you bring a camping chair or blanket and look straight up without focusing on any single area in the sky. If you choose to photograph the shower make sure you use a lens which can cover a good portion of the sky and bring lots of snacks! Try not to look at cell phones or use flashlights that aren’t “red lights” this damages your night vision. When you first arrive at your sight make sure you allow 10-15minutes for your eyes to adjust to the night sky. Do not look at or into any light sources, it will tak you another 15 minutes for your eyes to adjust into (night mode). Check back for a follow up to the shower and happy meteor hunting! I found myself at 3,500ft in elevation with crystal clear skies on Friday April 20th, 2012. Being “Park Week”, I had no choice but to visit a long time friend of mine; Shenandoah National Park in Virginia. With the forecast looking poor during the peak activity, I arrived a couple of days early to maximize my chances at a clear night. The first night was clear, but the dew point was causing issues with creating tons of condensation, which formed on everything. Things got a little hairy at point when a black bear approached us at 11pm in the pitch dark. I didn’t realize he was there until I heard a stick break and then noticed the bear 50 feet away. He growled and made noises, but kept on moving towards the east with no issues at all. The second night there wasn’t a problem with condensation forming on my gear because we had gusty winds near 40mph or higher along the ridge preventing that from happening. The sturdy tripod made all the difference this night taking the stronger winds. Keeping the tripod low to the ground increases the stability. A steady rain, followed by 6″ of snow blocked any chance of observations for the “peak night”. But the night before offered some gorgeous views of the heavens. 2012 is a great year for meteor showers unlike 2011. The next “major shower” is May 4/5, but the full moon block out all but the brightest meteors. (ATREX) Mission:Night Shinning Tracer Clouds over the East Coast, Thanks NASA! After weeks of delays from Mother Nature it happen….. 5 rockets in 5 minutes! The launch began just before 5am starting a onslought of rockets and chemical trails in the upper most part of our atmosphere. I spent a lot of time driving around and staying up late at night the last couple of weeks, it all paid off this morning with a successful launch from the Wallops Flight Facility in Virginia. I didn’t have the time this week like last week, so I couldn’t make another 400 mile roundtrip, over-nighter this week. I had some great spots less than 20 miles from the Wallops Flight Facility I “scouted” in earlier weeks…like the photo below. On earlier launch attempts I had traveled hundreds of miles to get into great locations within 20 miles from Wallops Island. This was my “secret” spot that I had planned to photograph the launch from. If it wasn’t for a boat, I would have had it last Friday morning, but luck wasn’t on my side that night. Imagine this picture with glowing eerie clouds piercing through the sky in the early hours before dawn. I can’t help but to beat myself up, but there wasn’t anything I could do about it. I am just happy that I was able be a witness to the spectacle. Here are some other shots from some failed attempts as well as a few more from this morning. It was a great ride the last 2 weeks and I can’t wait for another launch.. I hope next time NASA launches 12 rockets in 12 minutes! Keep your eyes to the sky, you never know what you may find. I drove 3 hours, about (180 miles) to view the launch attempt at Wallops Flight facility in Virginia, Thursday night, March 22/23, 2012. Weather has been insane across much of the country, but this night seemed worth the trip. With clearing in the forecast, I left Pennsylvania around 8:45pm and arrived on Assateague Island National Seashore around midnight. The weather was perfect for the first 45 minute’s, then some clouds started to pass through. I really wanted this to happen after driving a good distance, but as the skies cleared another issue came up and the launch was cancelled. I would be lying if I said it didn’t bother me, but I made the best out of the trip. I continued to shoot through the night working on some personal projects. I started to see a few meteors fall from the same location in the sky. I ended up catching this falling star between the clouds in the early hours of Friday morning. Seeing a few meteors really made the trip worth it, and catching one on “film” made it even better. New meteor shower discovered? The point is you can predict all you want, but there will always be unseen issues and surprises along the way, and you won’t know what they will be until you put yourself out there. I plan to capture the mega launch of 5 rockets in 5 minutes again this week. The skies will be clear as weather patterns are shifting, bringing in a new wind. Lets hope that the ” planets will align” this week and give us what everyone has been waiting for! WARNING! Sunset Sky Show Tonight! For the second night in a row we will be able to witness a Celestial Triangle in the western skies around sunset. Tonight, (Feb. 26th, 2012) the Moon and Jupiter will be near to each other with Venus shinning bright just below them. The clouds and 50 mph wind gusts last night worried me some, but the weather worked out perfectly. The clouds actually added a little flavor to this photo. Where should you look tonight? Look to the west just after sunset and you will see the “trio” piercing the sunset colors. The best time is to check it out is 15 – 30 minutes after sunset. The ambient light is much lower making the objects really stand out. I decided to head out again Sunday night for a follow up appointment with the celestial triangle. I did some time lapse photography and still last night. The video will be available shortly. Here is a photo from the “firepit” last night. The exposure is a couple hours long. Note all of the air-traffic.